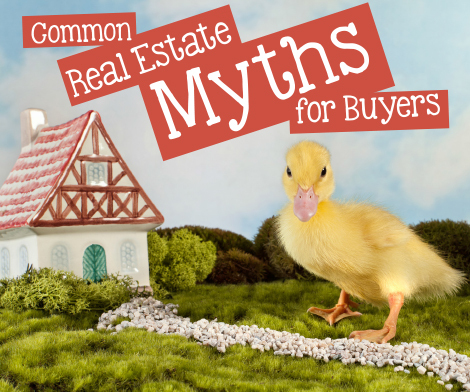 We thought we’d take the time to correct some common home buying myths that have been fooling real estate consumers for years. Here’s a look at four real estate myths that frequently come up with first time buyers or buyers who haven’t been in the market for a while. All agents have access to the same MLS listings in your area, so you are not going to gain access to more houses by working with more people. It is in your best interest to find an agent with a communication style and commitment level that matches yours, and let them do the hard work for you. Of course it makes sense to offer a lower price than you ultimately planned to pay and negotiate your way up, but there are times when this strategy can backfire. In a hot market, a home may have multiple offers and the seller might move yours to the bottom of the pile without ever responding. Even if a property has been on the market for a while, an offer that is too low could offend an already-frustrated seller and prevent them from doing business with you. Or if they do decide to work with you, ill feelings caused by your initial offer could make negotiations even trickier. Home inspections and home appraisals are two entirely different things. A home appraisal is an estimate of the property’s value that is performed to safeguard the lender. A home inspection is an assessment of the condition of the home done to educate the buyer. An appraiser notes the value, whereas an inspector notes the condition. Even if the home you make an offer on appraises for the sale price, there could still be broken or unsafe elements. In some instances, you can negotiate with the sellers to have these items fixed. This is just one way a home inspection comes in handy. Click here to discover what buyers need to know about home inspections. This entry was posted in Uncategorized and tagged buying real estate, real estate. Bookmark the permalink.